Hartlepool United's director of football Craig Hignett and owner Raj Singh in the stands. 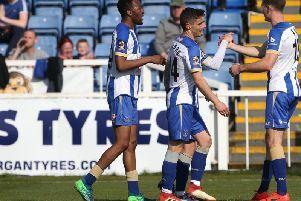 Deep thinking, “Student of the game” Matthew Bates is the perfect fit for the National League and the future of Hartlepool United, according to Craig Hignett. Now, with the retained list agreed and transfer targets in sight, the Pools director of football is determined to arm Bates with the players to keep the club moving in the right direction. “He’s a student of the game,” said Hignett of former caretaker and defender Bates, appointed in a full time capacity this summer. “He’s quite a deep thinker and he knows where he is - he knows he’s not in the Champions League group stages and that he’s in the National League. “He knows what’s required to get out of the division, he’s clear in how he wants his team to play like, he’s very clear on the type of characters he wants around the place. After what seemed like a lifetime of deal delays and wrangling, Hignett and new owner Raj Singh, aided with a chunk of cash from Jeff Stelling, finally got their feet under the table at Victoria Park a few weeks back. While due diligence was done solicitors and it seemed like the full financial picture was known at the club, a few skeletons have still fallen out of closets. “It’s been hectic,” Hignett said of his return to Pools in a more senior capacity, having managed the club from February 2016 to January 2017. “But until you get fully in you don’t know the extent of what you will find. “Day by day we’ve been turning stones and finding something else. “It’s been an eye opener, but very enjoyable at the same time. “The club needs a massive overhaul, it needs re-structuring from top to bottom, needs re-structuring on the pitch and it’s going to be a big job. “For too long people have taken the club for granted and lined their own pockets and not done things for the good of the club. “Now with the changes we have made the club is going to be on a sound footing and will be able to move forward in the correct manner. Change off the field and change on it, whatever happens between now and the start of the National League campaign in August, it’s set to be an intriguing summer at the Vic. In relation to the club’s direction on the park, reflecting back on the end of last season, Hignett said: “I was fortunate I’d only watched the back end of the season. “The only two bad results were probably Solihull and Guiseley at home. The first one we saw was Fylde away, they drew 3-3, it was a great game. “They played some decent stuff at times and other occasions didn’t play so well but got the results. “The one thing the manager has done since he came in has been to get a reaction that’s for sure. Between him and his coaching staff they’ve moved the club in the right direction.